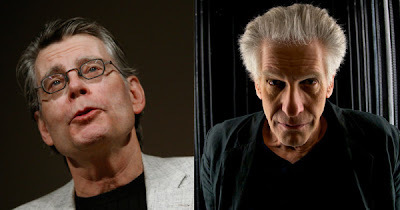 The Horror Section: King & Cronenberg: One Night Only! King & Cronenberg: One Night Only! Thursday night I was witness to what could possibly be a once in a lifetime experience. I saw Stephen King & David Cronenberg live on stage at the Canon Theatre. It was an event put on by Simon & Schuster to promote Stephen King's new novel Under The Dome. King then read from his new book, Under The Dome, in that distinctive accent and tone of his. He was nervous about that as well because just before taking the stage, he'd dropped his pages and wasn't sure if they were still in order. Under The Dome has a brilliant setup and is, as King put it, a microcosm of the current state of affairs in the U.S. I'm expecting good things, as these types of stories – like The Mist, the Boulder/Vegas sections of The Stand & The Langoliers – have always been among his best I think. After the reading from Dome, David Cronenberg came on out. Probably the big news of the night was that King has been toying with the idea of writing a sequel to The Shining, which would involve a now-fourty-year-old Danny Torrance working as an orderly in a hospice. He's obviously traumatized by his experience at The Overlook and lives day-to-day, supplementing his income by 'winning' on the horses. Danny also sits with elderly patients that are about to die - much like a certain cat that King read about - so the staff begin refering to him as Doctor Sleep. King's Kubrick impersonation was bang-on! These are just some of the great stories that were bandied about and was precisely the reason the seventy-or-so minutes flew by like a shot. I can tell you that everyone in attendance would have been captive for many an hour. It was a fascinating night and I was just glad I was able to be a part of it. My only regret is I wasn't quick enough to snap off any pictures of the occasion. This is AMAZING! 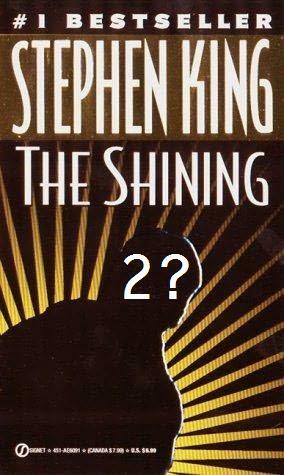 Very awesome and I can't believe I read the words "a sequel to the Shining" and was excited about it! I love that Cronenberg seems like such a deadpan comic. Awesome job on this post! I felt like I was there. The Pile: Gore A Go-Go! At Least The Rent Is Cheap.